Gel Fillers - Restylane, Juvaderm and Perlane are used around the eyes to treat hollows, dark circles and depressions. They are composed of Hyaluronic acid, a natural substance in our body which is lost with age. The gel (Restylane, Juvaderm or Perlane) is injected into the hollow or depression to fill the area and improve contour and appearance. Dr. Guy Massry, Beverly Hills ophthalmic plastic surgeon http://drmassry.com, is a specialist in gel fillers (especially Restylane) around the eyes. Dr. Massry prefers Restylane because it has not had more than minor side effects in his hands when compared to Juvaderm. Perlane is to thick a gel to use around the eyes. Dr. Massry has recently completed his second textbook http://www.springer.com/medicine/ophthalmology/book/978-1-4614-0066-0 in the field of aesthetic eyelid rejuvenation. There is a chapter in the book just on the subject of filling around the eyes. Dr. Massry has treated many patients with eyelid filler in the last decade. Filler is reversible with the injection of another medication (Vitrase or Hylaluronidase) – so complications are rare. However, eyelid filler should only be done by an eyelid specialist. This makes sense as the eyes are so important in appearance and function and are such delicate structures which control our most important sense – vision. If you are interested in filler around the eyes (with Restylane), or in the treatment of eyelid hollows, depressions or dark circles Dr. Massry would be happy to see you. While Dr. Massry practices in Beverly Hills and Los Angeles, he sees many patients from surrounding areas such as Newport Beach, San Diego and Irvine. To contact Dr. Massry just call his office (310) 453-8474 or access his web site http://drmassry.com. Eyelid paralysis/paresis (weakening) can occur secondary to Bell’s palsy and other such processes. This is a very frustrating problem as when the eyelids are weak, they do not close, the lower lid can drop and both appearance and function suffer. There are many ways to address these issues with surgery (gold weight implant, canthoplasty, etc.) and non surgically with fillers (Restylane, Juvederm, Perlane) or with Botox. These last solutions are temporary but allow the patient to avoid surgery. Dr. Guy Massry is an eyelid specialist (practicing in Beverly Hills and Los Angeles) who sees patients with paralyzed eyelids from Bell’s palsy and other similar processes routinely. Dr. Massry teachers and writes on various different eyelid surgical procedures regularly. His most recent textbook has just been published http://www.springer.com/medicine/ophthalmology/book/978-1-4614-0066-0. Dr. Massry has had much success treating theses problems surgically and non-surgically. More information on Dr. Massry can be found on his web site http://drmassry.com . If you have eyelid paralysis/paresis (weakening) from Bell’s palsy and want an improvement please contact Dr. Massry’s office at (310) 453-8474 or look him up at his web site http://drmassry.com. Dr. Massry has offices in Beverly Hills and Los Angeles, and sees many patients from surrounding areas such as Newport Beach, San Diego and Irvine. He looks forward to helping you with this troublesome problem. Upper lid blepharoplasty (eyelid surgery) is performed for both cosmetic and functional (to improve field of vision) reasons. When surgery is performed for vision improvement (if you have private insurance) it requires pre-authorization with your insurance company prior to surgery. If you have Medicare there is no pre authorization and you must understand that surgery may be denied. 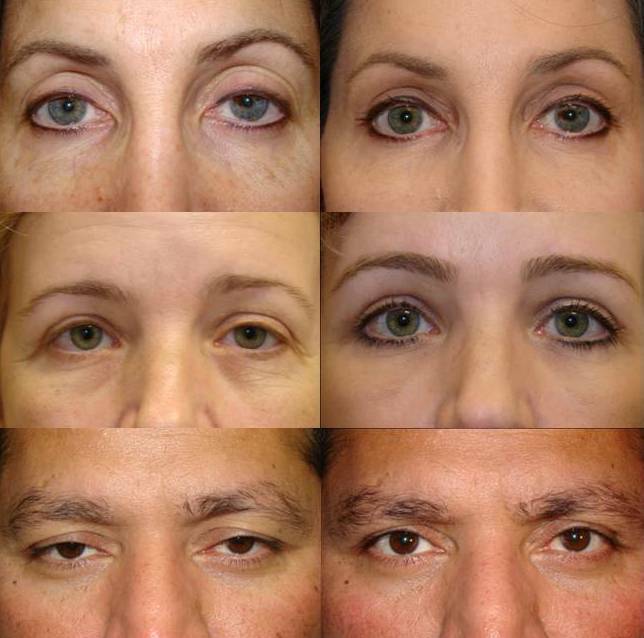 The pre-authorization for upper lid blepharoplasty (eyelid) surgery requires photographic documentation of the heavy lids and a field of vision test. This information is sent to the insurance company. The insurance company will then notify the physician and patient of the decision. 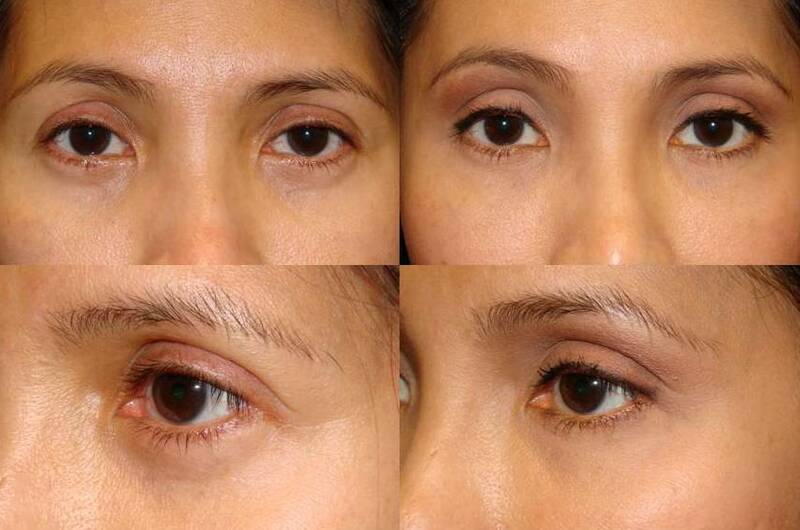 If approved – blepharoplasty (eyelid) surgery can proceed. Upper blepharoplasty surgery for vision improvement is the same procedure as is performed for cosmetic surgery – bit often times more conservative as the goal is improvement in vision not appearance. However, surgery is performed in an aesthetically pleasing manner. Traditional blepharoplasty (eyelid surgery) has often led to a gaunt or skeletonized look. This can leave patients seeking remedies that are hard to find as too much fat has been removed from the eyelids – which can be a challenge to correct. Modern day blepharoplasty surgery avoids these problems by preserving eyelid fat via translocating prominent eyelid fat to adjacent areas of depressions. Below is a patient example of fat grafting to the lower lids (performed by Dr. Massry) to correct hollows from previous surgery by another surgeon (left-before/right-after fat graftiong to the lower lid hollows).